Today I bezeled 3 more small lava beads. Hopefully this time they are going to be enough. 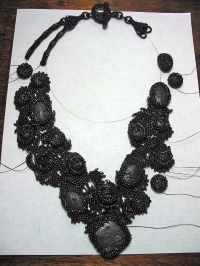 I'm looking forward to finish the base of the necklace and start playing with the ferns and flowers for the embellishment. I added a recipe for Murphy's Nuked Veggies on the message board. Wow only 19 days in and already it looks so great...I can't wait to see the end result. Looks great. THanks for the update I am glad to see that you got some work done.